As the Bank holiday Easter weekend was mostly rained off, we managed to finish the makeover of the twins industrial style bedroom. The whole transformation cost us just under £400 in total which included buying all the scaffolding, planks, paint, chairs, accessories etc. I’m really pleased with how the room turned out, especially the pine chest of drawers above. As a total white fiend I was a little apprehensive about painting not only the chest, but a wall and a cupboard black! But I think it all balanced out in the end. When we moved into the house 11 years ago, the twins bedroom was one of the only really habitable rooms. You can see from this post how we decorated it when they were little. I loved the fresh blue and white but now that they are eleven years old they have outgrown the bunk bed and most of the toys so it was time for a change. Before pic of the built in shelving and erm, THE MESS !! My husband built in this shelving several years ago. (There used to be a huge old fireplace on a chimney breast ) It took up far too much space, was ugly and totally impractical so had to go. The plan for the bookcase was to utilise it for a computer/work station for one of the twins. it wouldn’t need much, a lick of paint and a built in sliding shelf for the keyboard. Before pic of the other side of the room ! oh the shame ! 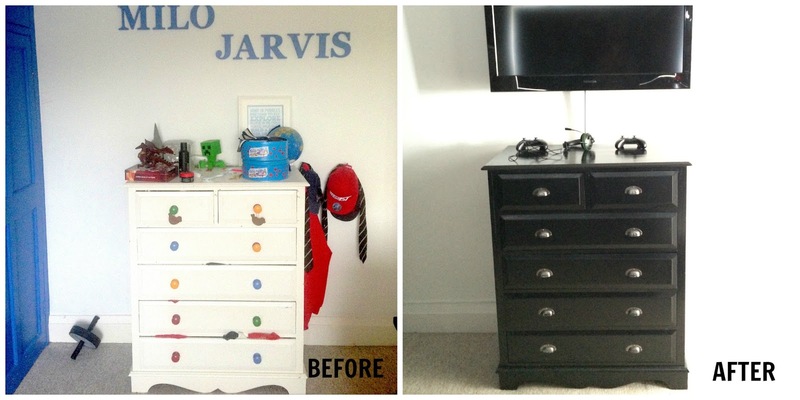 The challenge with the new look room was to make a space that was both appealing and practical for both boys. The twins are very different in their likes and dislikes and needed a room that would reflect both their personalities, give them a sense of their own space, but that would also look co-ordinated and finished. I think we have achieved that and luckily they love it too. The cupboard doors painted black and panels covered with carbon fibre wrap. The door handles are water valves. The storage/bookcase/computer work station is not quiet finished but its looking much more organised and all the toys and books that were too young for the twins have been packed up and shipped off to the charity shop. As we took the big decision to let the boys move upstairs into their room with their computers and xbox it was important that they also had comfortable seating. We found these stylish black leather style chairs on Amazon. They are adjustable and solid, perfect for spending perhaps a bit longer than you should sitting down during the holidays ! They were a bargain at just £58 each. Milo made us chuckle with his choice of framed poster. Some might recognise it as the dark side of the moon album cover from Pink Floyd. To Milo its a light splitting prism ! He’s not wrong. We used one of their old skate boards as a shelf and painted their wooden names to give them a new lease of life. I am not really happy with this space, I think the proportions of the items on the wall are all wrong, we need to put something else up there but because Milo is a bit of a restless sleeper we are going to wait a while. When I posted on Facebook a photo of this rubber flooring I had a lot of people guessing what we were going to use it for. Nobody guessed we had decided to use it for blinds in the twins room. We already had the runners from IKEA that we had used previously for the window in the twins room. its a really large window, making it difficult to dress affordably. I am usually the one who comes up with the innovative ideas for decorating around the home but when I mentioned to my husband we needed something individual that would also be affordable but most importantly block out the pesky morning light, he came up with the idea of using the rubber flooring ! Inspired ! It was certainly affordable and is absolutely perfect as a window covering. We gave the old off white radiator a new lease of life with a spray of silver paint. On the other side of the room is Milo’s custom made computer station is made from scaffolding poles and MDF covered in Formica. The shelving we made from scaffolding boards we painted and distressed to make them look worn. We painted the wall BLACK ! Faints. Its not so bad actually. Jarvis’ space fits his personality with room for his trophies and sporting memorabilia. So that’s it. A few little things to finish. Hubby wants to build a lighting platform on the ceiling with neon down lighting and ideally, we would like to get rid of the carpet and put something more in keeping with the room on the floor. But that will have to wait until funds allow. Wow what a difference. It's brilliant. I'm so impressed Karen ! What a perfect room for boys. This looks very bachelor pad now!! Very grown up! Wow, what a transformation. I would never in a million years have guessed you were making window blinds from that material. What a fab idea. I bet the boys love it! Well done, you've done a great job and they must be thrilled with it! This is soooo cool! I'll bet the makeover was a real hit at your house. I haven't visited your site before, Karen, but I am so glad I did. The water valve handles and press plate are such a great idea…The scaffold shelving is inspired. Its great to see something so original!